Chris’ love for the mountains, and more specifically the David Thompson Corridor, has shaped the path his life has taken. Stumbling upon the corridor in 2010, Chris began exploring every valley and peak immediately and still finds himself staring out the window while driving, dreaming up new adventures each time he turns onto that magical highway! A chance encounter with rock climbing in middle of nowhere Nova Scotia has led him on journey to becoming a Mountain Guide. While rock climbing is what started this path Chris pursues all forms of mountain travel whether it be on snow, ice, rock or dirt. Chris finds passion on big alpine routes, slivers of frozen blue ice that flow through natural features on the rock, and even the smallest roadside crag! Chris has climbed on the sharp granite boulders near Halifax, Nova Scotia right across Canada to the soaring granite slabs of the “Chief” in Squamish, British Columbia. Chris has also made several trips throughout the USA always ending up in Red Rocks state park in Nevada, which he finds to be the most inspirational place to climb. More recently climbing has taken Chris to Cuba to climb in the beautiful Vinales Valley. But after every trip Chris begins to shake with anticipation when he turns onto the David Thompson Corridor and can start pointing out the peaks that have become old friends to him. While Chris finds climbing for himself a deep and crucial experience, he has begun to explore what he can offer to others through his passion. In the summers Chris teaches youth and adults alike the basics of climbing and has been honored to work with a group from the Canadian Paraplegic Society, which was a deeply humbling experience. This past winter Chris has been working with young adult males in an addictions treatment center which uses wilderness therapy as its foundation for treatment. 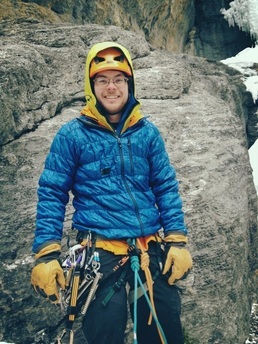 This experience has sparked a new passion in Chris using climbing as therapy. Perhaps the most challenging and rewarding day Chris has spent in the mountains however, was getting his dad to the top of mount Stelfox! Chris looks forward to joining the ELS crew and exploring new ways to use his passion to work with others.